There is a beautiful picture trending on mainstream national media that says so much about the beautiful process of surrogacy, and especially the process that Gay Fathers go through to become Fathers. The raw emotions, the longing, the lengths they go to to be parents all speaks to the wholesome truth that they put all of their love into being exceptional parents. We at Simple Surrogacy often get to see and witness the raw emotion in the moment when a Father gets to see their child for the first time. We have seen how it can transform even the strongest man into an emotional mass of pure love for his son or daughter. How wonderful that an amazing photographer was able to witness this firsthand, and to capture the amazing real love that pours forth at such a moment. 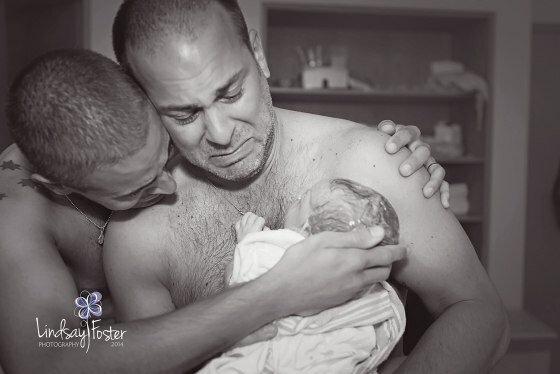 This is just an amazing photograph, and we are so happy that the world can now see the raw emotion and love that these Fathers feel, that our amazing surrogate mothers gift to them when they help them bring their children into the world. I hope every woman contemplating being a surrogate can see this picture, and see what gift it is that they give to each and every person they help to feel this very love. Congratulations to the Fathers shown here, and especially to the wonderful surrogate who enabled this beautiful moment. 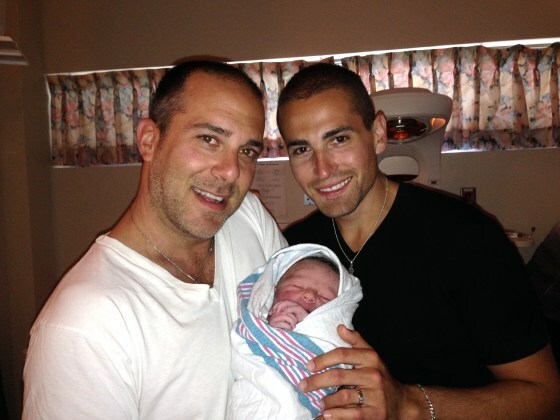 Just before a gestational surrogate gave birth to their son in Kingston, Ontario, a midwife screamed “shirts off” so new dads Frank Nelson and BJ Barone would be ready to hold their baby against their bare chests for skin-to-skin bonding. 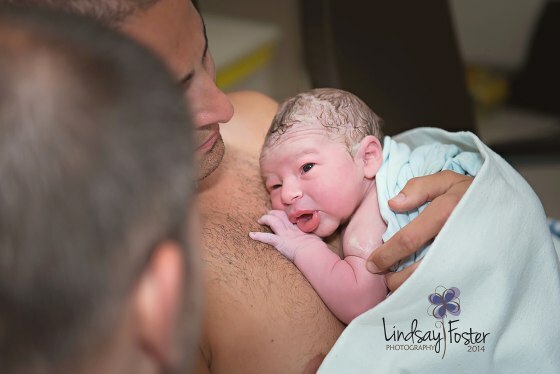 Photographer Lindsay Foster was shooting the birth as a gift to her friend, Kathy Frenette, the couple’s surrogate. Foster caught the instant when baby Milo was held by his fathers for the first time, even before the umbilical cord had been cut. In the photos, a shirtless Nelson, 44, holds Milo to his chest, and Barone, 34, has an arm around each of them, as the new dads shed tears of happiness. The couple took a few photos of Milo with a cellphone camera, and Nelson joked that they were happy with the 200 “likes” that one received on Facebook. But that was nothing compared to the response that two of Foster’s photos got when she posted them on Facebook, and they quickly went viral. The couple are still in disbelief when they stare at the photos and see exactly how they looked. The Toronto couple, married for nearly four years, say Milo has great timing. Their first attempt at having a child failed, and Milo, the son of two high school teachers, was born at the end of the school year. He arrived on June 27, during the World Pride gay rights festival in Toronto. As the photos went around the Internet, the comments poured in. Some posted negative jabs, but most were positive. One man wrote that the photos “had opened his heart to acceptance, and that the love shown for a child has no boundaries,” Barone said. Their photo was shared by actor George Takei, an original “Star Trek” cast member turned gay rights advocate with a huge Facebook following, who wrote, “Congratulations, new fathers. These photos are a wonderful reminder that love is what makes a family.” Nelson said he was pleased that the photo had launched an online discussion about gay rights and what it takes to be a good parent. “This can open the minds of people, and start a conversation, that all that a child needs is unconditional love, be it from a man or a woman or anything in between,” he said. The two dads forgot their camera in the rush to the hospital for the birth of their son, but a professional photographer’s shot of their unforgettable first moments with the baby went viral. For Foster, it was the first time she had photographed a surrogate birth. While she is used to the pregnant woman needing support during labor and delivery, this time, she felt there were three parents who needed a boost. 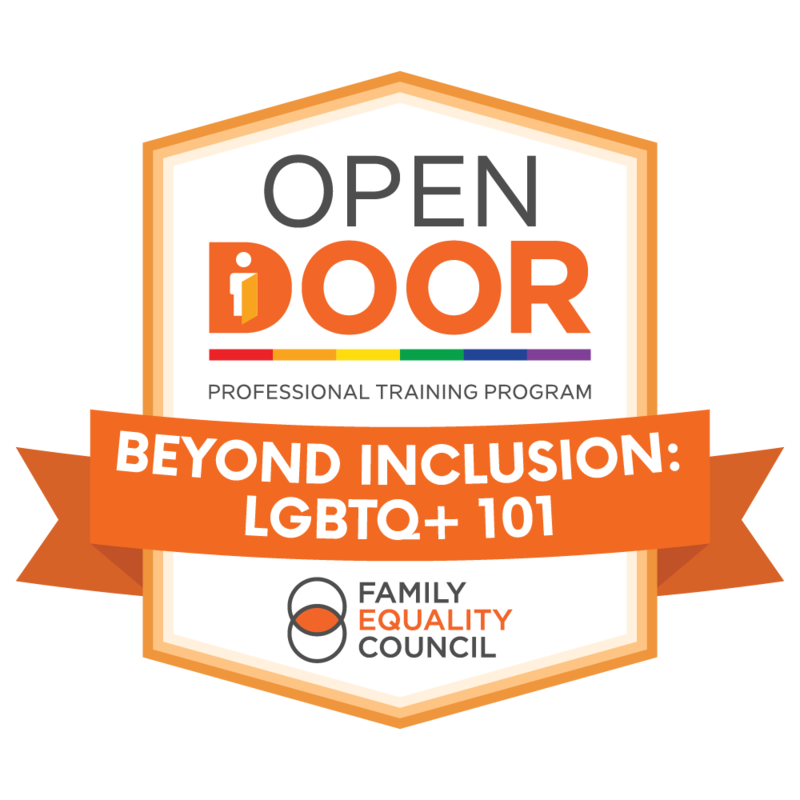 She learned a month before the birth that the intended parents were a gay couple, which she said made it special because it’s so unusual. The couple are back home in Toronto, still staring at those first photos and enjoying the newborn days.